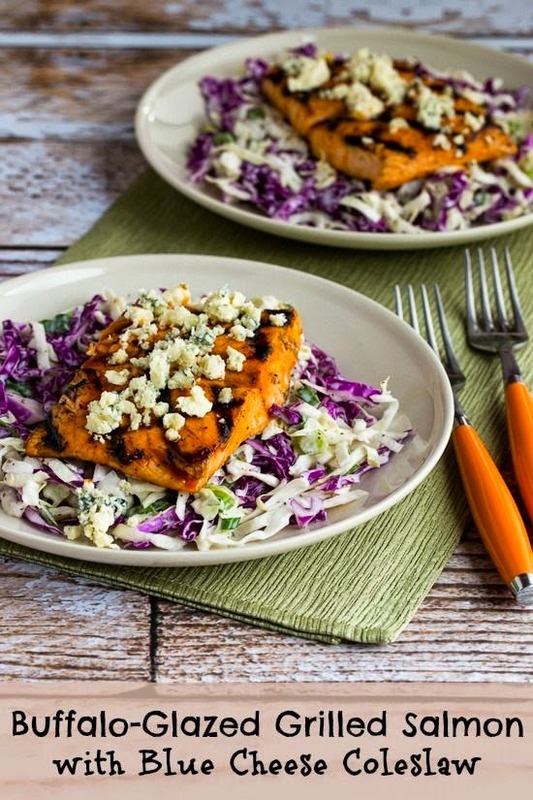 For a mouth-watering new take on grilled salmon, try this Buffalo-Glazed Grilled Salmon with Blue Cheese Coleslaw! I'm a huge fan of grilled salmon, something I make all year long on my outdoor grill or using a stove-top grill pan when it's too cold to grill outside. And while I do have some favorite grilled salmon recipes that I make over and over, I'm always thinking about how to add a new twist to salmon cooked on the grill. So recently when I got a bit obsessed with Frank's Red Hot Sauce and Blue Cheese Coleslaw, this idea for Buffalo-Glazed Grilled Salmon with Blue Cheese Coleslaw popped into my mind, and it was a total winner! I loved the way the spicy buffalo glaze on the salmon was cooled down by the creamy coleslaw, and even though some people say cheese doesn't go with fish, we thought the crumbled blue cheese on top of the salmon was the perfect finishing touch.